My excuse for not blogging. So this has happened. It may take a little while to make it from the publisher in the UK to booksellers around the world, but I still thought I’d take a moment this morning to tell you all a little bit more about it. Education Is Not an App came about as a direct result of this blog. Terry Clague from Routledge was an MOLB reader from way back, and he gradually convinced me that getting some of the sentiments contained here into book form was a good idea. Still don’t know what a MOOC is? Read this book. Afraid the robots are coming for your job? Read this book. Do you teach critical university studies? We speak your language. Are you a university IT professional looking for a relatively short, highly-readable group read for your faculty development workshop? Well, we have a book for you. Longtime readers of this blog like Terry will recognize many of my well-worn sentiments in these pages, but there’s also tons of outside-the-box, totally new stuff. Most of that is the direct result of my co-author, Jonathan Poritz – JP to our mutual friends who want to distinguish us more easily. JP too was reading this space way back during the “Year of the MOOC” and he served as one of my very few guest posters. “You should write a book about MOOCs,” he told me at least a couple of times. “Nah,” I said. “MOOCs are just a fad.” Well, I was at least kinda right. But as anybody who knows anything about this subject will tell you, there is a lot more to edtech than MOOCs and we wrote a book designed to take in as much of it as we could. 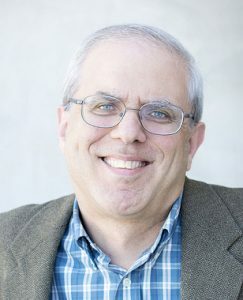 Since JP already knew so much about copyright, OER and other very important subjects that I never touched on this blog, he proved to be the perfect co-conspirator. If you don’t want to read it because you still think I’m just that guy who hates MOOCs, you’re in for a surprise. For one thing, I only hate some (OK…most) MOOCs now. 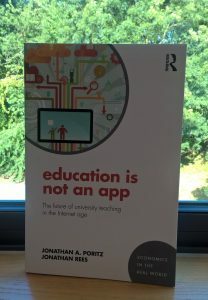 Indeed, this is ultimately a book about distinguishing good edtech from bad edtech and we argue that the key to doing that is faculty autonomy. When administrative bean counters and greedy edu-preneurs run education technology, education suffers and the vast majority of faculty suffer with it. On the other hand, when caring faculty are given access to worthwhile tools and the autonomy to use them the way they want to use them…well, that’s when the magic happens. For that magic to happen, however, also requires professors everywhere to pay at least some attention to an edtech space that’s literally changing all the time and not always in good ways. That’s why this book is intended as a primer for any faculty member, anywhere in the world, who hasn’t been paying attention while their world has been changing. JP even managed to convince the publisher to mark down the list price of the e-book (and the paperback to a lesser extent) so that you can easily learn more about your professional future without having it cost you an arm and a leg. Not ready to buy it yet? I’ll point to some of the publicity we’re doing for the book from this space as it becomes available, and maybe we can convince you then.